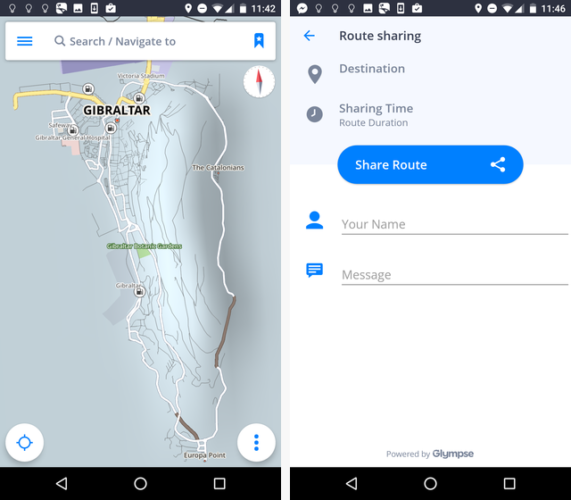 We already know there are lots of great navigation and maps apps for when you do have a data connection, but what about when you need your location when you’re offline? Offline GPS is a vital feature for any maps app. Ironically, it seems you’re most likely to get lost when you don’t have a connection, perhaps because you’re exploring a foreign city and have data roaming turned off, or because you’re on a cross-country road trip and find yourself in a dead zone in the middle of nowhere. 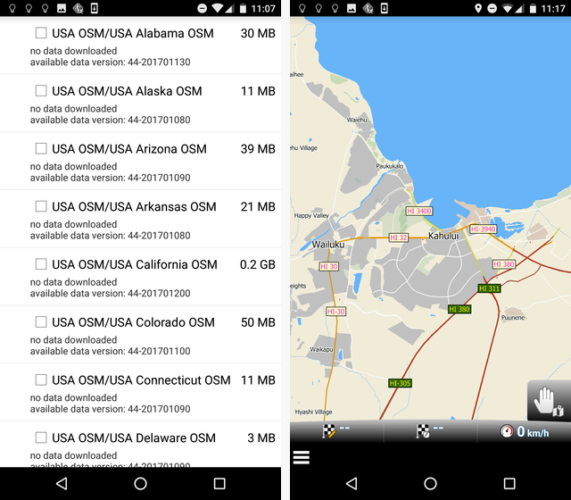 Here are four free offline GPS apps for your Android device. Download them, and you’ll never get lost again! Yes, I know, it’s obvious. But I can’t write a list like this without giving it a mention. And it’s more than deserving of its place. If you’re on Android, nothing else comes close for ease-of-use and integration with the operating system. Microsoft’s Maps app could give it a run for its money, but at the time of writing, no Android version is available. If you want the Google Maps app to work offline, you need to do a bit of preparation. Tap the three-line icon in the upper, scroll down, and select Settings > Your Offline Areas to see what locations are already stored. In most cases, Google will have already automatically saved your local area offline. To download a new area, tap Custom Area, drag the window to the part of the map you want to save and click Download. In the image below, you can see the maximum size of the map you can download. It equates to an area of roughly 200 miles x 120 miles. There are some limitations to using the app offline. The app limits the maximum size of each individual offline file to 2 GB. You can work around this by saving lots of offline maps, but it’s not efficient and should only be used in extreme circumstances. 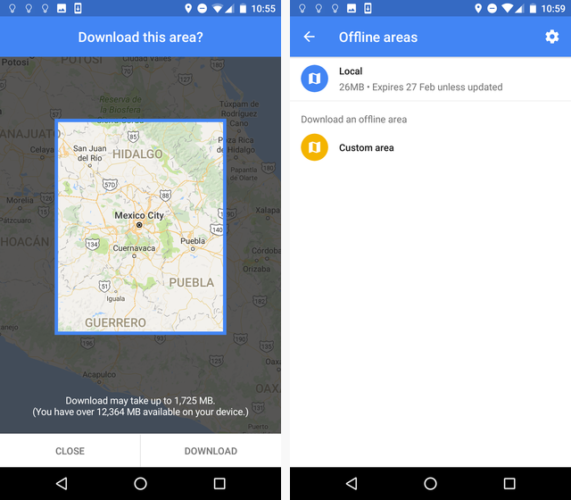 Furthermore, the app automatically deletes any downloaded maps after 30 days without an internet connection. If you’re planning to trek through a rainforest for six months, it’s not a suitable solution. If you want to try a non-Google alternative, the best choice is arguably MapFactor GPS Navigation Maps. It’s free to download and doesn’t require in-app purchases. When you fire up the app for the first time, it will prompt you to download maps for offline usage. That’s because there is no online map function — so don’t download the app and expect to have a map of the entire world at your fingertips. There are more than 200 individual maps to choose from, including 56 in Europe and 53 in the Americas. They are organized by country, but densely populated areas have sub-regions available. You can also find maps for speed cameras in certain areas. Each map pulls its data from OpenStreetMap. Once the maps have downloaded to your device, you can search them manually by tapping on Map or ask for directions by heading to Navigate. The Navigate tool has some useful built-in features including a live odometer, route simulation, and route replays. You might not have heard of Sygic, but it’s powered by TomTom — so you can be confident in the accuracy and quality of the directions. Drivers can enjoy speed limit warnings, speed camera warnings, fuel price suggestions, and even parking availability. People on foot benefit from pedestrian zone navigation and offline locations of popular sights, tourist attractions, hotels, etc. Though some of these functions are limited when you’re using the app offline. When you open the app, it will recognize your location and prompt you to download the relevant map for that area. If you want a different locale, tap Choose Another Country. The maps themselves are clearer and easier to interpret than MapFactor. It’s simple to switch between walking and driving modes, and you can easily share routes with friends and family if you’re all making the same journey. The premium version adds various features such as live traffic reports, a HUD to project GPS directions directly onto your windshield, a dashcam recorder, and lane guidance. However, if you’re planning to predominantly use the app offline, those features aren’t necessary. In-car navigation is the primary focus of CoPilot GPS Sat-Nav Navigation. People on foot should avoid it. The app excels in route planning. For every journey, it will give you three separate options. If you’re using the app online, they’ll be accompanied by traffic reports. For each of the three routes, you can add up to 52 individual waypoints. If you’re planning a road trip and want to make sure you see all the points of interest as you drive, it’s ideal. The developer has added thousands of offline locations such as hotels and restaurants. You can search all of them from within the app, even if you don’t have an internet connection. After downloading the app for the first time, you’ll be given a free seven-day trial of all the premium features. These include 3D maps and an audio navigation assistant. Once the trial expires, the app limits you to 2D offline maps and visual turn-by-turn directions. I’ll leave you with a quick word of warning: continuously running GPS apps in the background of your phone will drain your battery fast. If you’re walking, try to leave your GPS turned off as much as possible — and if you’re driving, think of investing in a portable charger or a car charger. I’ve shared four of my favorite GPS apps with you, but now it’s your turn. Which apps do you use when you need an offline map? Have you tried any of the apps on this list? Which is your favorite? You can leave all your tips, recommendations, and opinions in the comments below. Originally written by Chris Hoffman on March 23rd, 2012.